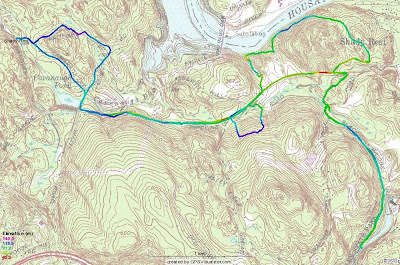 I didn't do all this on this ride but for anyone interested here is 75% of the trails in North Newtown and the Dinglebrook section of Brookfield. 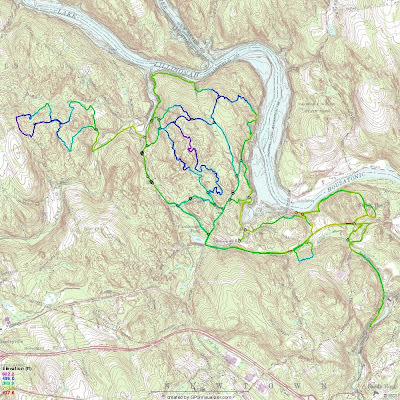 There are few more trails in Shady Rest I have yet to explore, as well as more on both sides of the Dinglebrook section as well. I also want to give the old Shepuag RR bed another shot. I have seen quite a few people walking this and it would be cool to ride it to the end (at Currituck road). As you can by the picture above I am one happy bike owner, hot and sweaty, with mud all over after 10 mile ride on what is essential a new bike. My Monster Cross bike is finished and trail tested. Granted a few things had to come together this past week in order to get this way. Monday, sold a bike and with that money I was able to do things right on the bike, namely get new crankset and have the bike tuned up. Took the bike on Tuesday to Brookfield Bicycle Center and Shawn and his crew did an outstanding job in installing the new cranks, recabling everything, especially the rear derailleur. It now shifts into the lowest gear! I was still having problems with the chain so I went out and picked up an 8 speed Z chain which seems to have corrected the problem. Having just rained I thought I would ride over to McLaughlin Vineyards via the old RR bed and check out the Black Bridge section of Al's trail. Also tried one of the off shoot trails in Shady Rest, which wasn't too bad and has a nice climb in it. After crossing over Walnut Tree Hill, Al's trail heads towards this pond which was created by beaver dam and the trail disappears so I had to head back onto the road. When the pavement ends, Black Bridge Road is still passable till you come to this bridge over the Pootatuck which is not passable, not to mention, if you were to get onto the other side you'd just climb up till you hit River Road, which would be end of the line. Never did see where Al's trail split off. I was having too much fun with the Qball Monster, especially trying to learn have to shift the barcons, which by the way are in friction mode. They work great but I think I need to either get real cross bars or cut an inch or two off of these. The end of Black Bridge Road winds up at a really neat section of the Pootatuck River. It's slow moving through here and combined with the pending darkness and mist from the recent rains in had a very eery feeling. Like I mentioned before, I tried one of the Shady Rest Trails. It wasn't too bad, dual track, like most of the trails back there. By the time I hit this section I turned my headlamp because it was starting to get darker and I new the section along the river runs through some pretty dense evergreens. 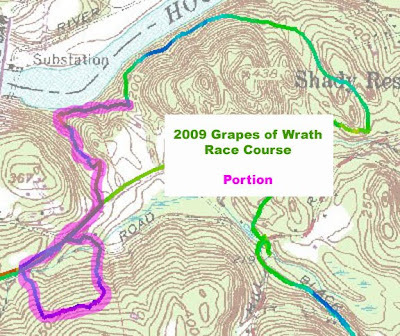 Then I hit some pink engineer tape that I figured was the Grapes of Wrath course so I followed that for about a mile before I lost it in the vineyards. I found the tape again, on the old RR line and I decided to follow it. It followed an old cart road, straight up the fall line of the slope (hint: bad choice) however the Qball was up to the task of making this climb, with Granny's help of course. What I found amazing, however, was how I was able to climb right up, largely due to the lack of suspension. The ride down was fun, a little more curvy and technical, tool. My son Elliot snapped a few pix of me when I got home. I think I need to raise the seat a little more and tighten the brakes and the Tour de Roxbury, here I come! Of course Elliot insisted on having his picture taken on his bike after he took a few shots of me. Here are a few post ride shots. And what better way to end a ride but with a nice stout!